The perception of Broadway Shows from their early years to their current level of sophistication and glamor is different. The early years of Broadway were an exciting and naive time of American self-discovery, scientific exploration, and profound decadence. Everything was new! Through the years "Big Street", as it was also known, acquired many colorful names many of which marked certain sections of the street: the 42nd street intersection is known to locals as "the duece". Throughout history Broadway has been a hub of vaudeville, minstrel shows, burlesque, and plays. It's always been a street of performers and performances. Broadway didn't get the nickname "Satan's Circus" by being cute and fuzzy. 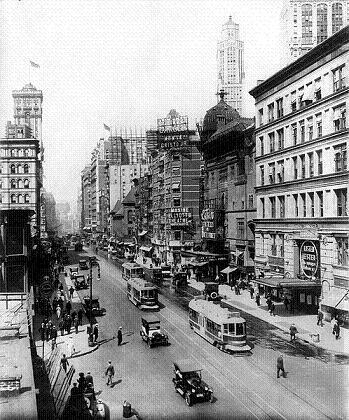 In the 1920's, Broadway offered an entertaining escape from the drudgery of everyday life, and added spice to an already bustling city. Broadway plays were marked by the handsome stars and the beautiful starlets that graced the golden stage nightly. Broadway's Dirty Little Secret & The Rise if the "Gold Digger"
Many shows that ran during the 1920's were written by Irving Berlin, who wrote "A Pretty Girl is Like a Melody" starring Eddie Cantor and Bert Williams, both who dressed in blackface for the role.